d) corroded or has deteriorated so that it is no longer safe. f) is fouling on the vehicle structure, wheel tyre or brake system component. 5. A lock stop is loose or damaged. 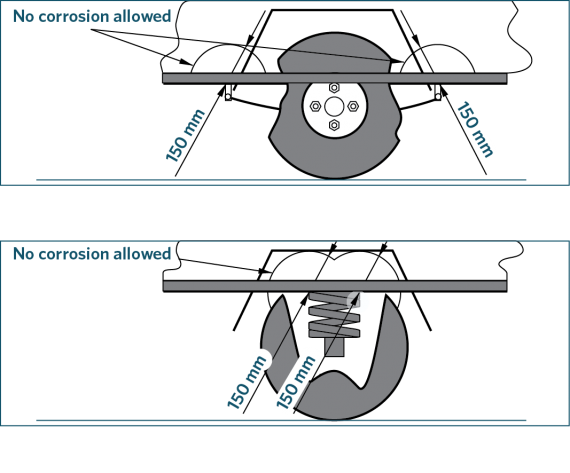 b) has corrosion damage (Note 2), buckling or fractures within 150mm of a mounting point (Figure 6-1-1). h) is a flexible bush that is significantly cracked, damaged or perished. 8. Air bag bellows has obvious external damage - protruding, exposed or worn cords. 9. There is corrosion damage (Note 2) within 150mm of a suspension component mounting point. c) the steering is unreasonably stiff or rough. Ballrace turntable means a device incorporating a low friction ball bearing fitted between two substantial structural components of a vehicle to enable rotational motion between those components about a vertical axis.